Are you in need of a break? Are you stressed out from all engagements and commitments? Are you missing the connection to what you’re doing, with who you truly are? Is it high time for some ‘me-time’? Do you want to make a new start, but you don’t know where to start? 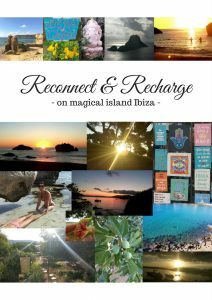 Book your personal ‘Reconnect & Recharge’ retreat on magical Ibiza now! With a Reconnect & Recharge retreat you gift yourself a new start. In 3 days you go through a complete transformation. You reconnect once again with your true self, you recharge your internal battery and we’ll create a plan so you can continue on this path in your day-to-day life back home. In these 3 days I’ll help you recognise your patterns, break through them and integrate changes for a better, more connected and more intense way of living. You’ll stay 3 days, 2 nights with me on a beautiful location in Ibiza. We’ll share a tasty, healthy homemade meal on the first night and all of your breakfasts are included. Each day we spend 4 hours together in which you’ll receive healing, coaching and guidance and I’ll show you some of my favourite places in Ibiza. 3 days all for yourself and with my love, attention & care for you! Reconnect & Recharge costs €1.111 as a 1-on-1 retreat. If you want to come together with your partner or a friend it costs €1.666 for the both of you. You can change your Reconnect & Recharge retreat according to your wishes! You can book extra nights, extra time spend together, extra meals, massages, private yoga classes, reflexology, stand up paddling and much more! Contact me now to book your own Reconnect & Recharge retreat. We can have a Skype call to talk about what would be the best time and options to suit all your wishes. I am looking forward to welcome you here! Want to get a feel of Ibiza? Have a look at my Facebook or Instagram (both @ankhanalovelight).